Fantastic card, MJ! How did you get your wavy pieces so perfect? You are so talented! Congrats again on your Artisan Award! I LOVE this card Mary Jo!!!! The way you did the water is so original – the different colors added in with the blue. Terriffic!!! Great card!!! That sun is super cool!! Just had to say that I know how to spell “terrific” 🙂 Pressed submit too quickly to catch myself. wow, what a really cute card this is! What a FUN card!!! It’s perfect…that sun is fabulous and then you made a tilt card out of it?! Amazing job! GREAT card! Every aspect of it is fantastic! I know what I’m making for my daughter’s summer birthday card – thank you for sharing your work!!! Oh my goodness! You are SO brave to sit and watch your kids in the pool! I used to have to walk away at their lessons, and peek around the corners, I was so worried for them, but they sure weren’t – and now they are fishes! Fabulous card – I need to try a “moving” card…. 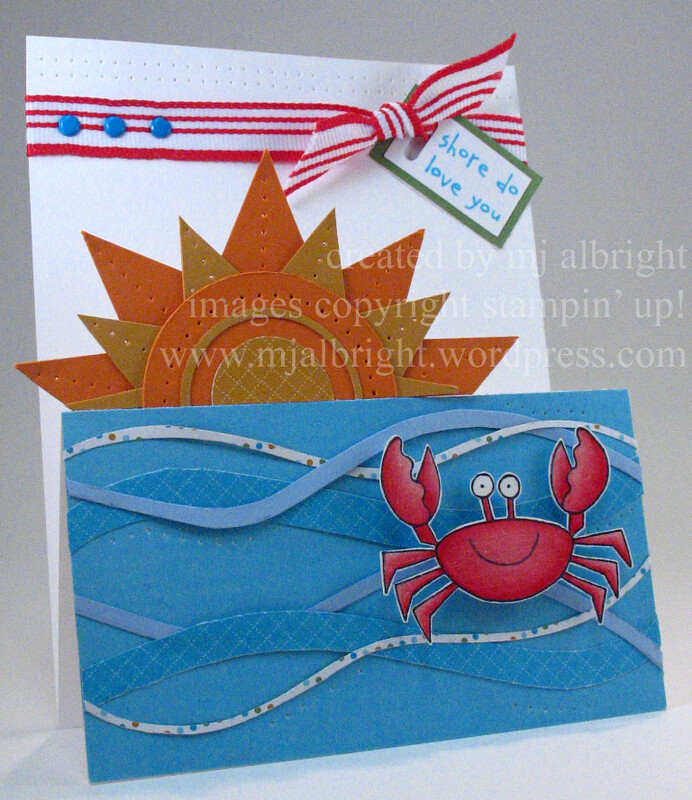 such a cute and very summery card! 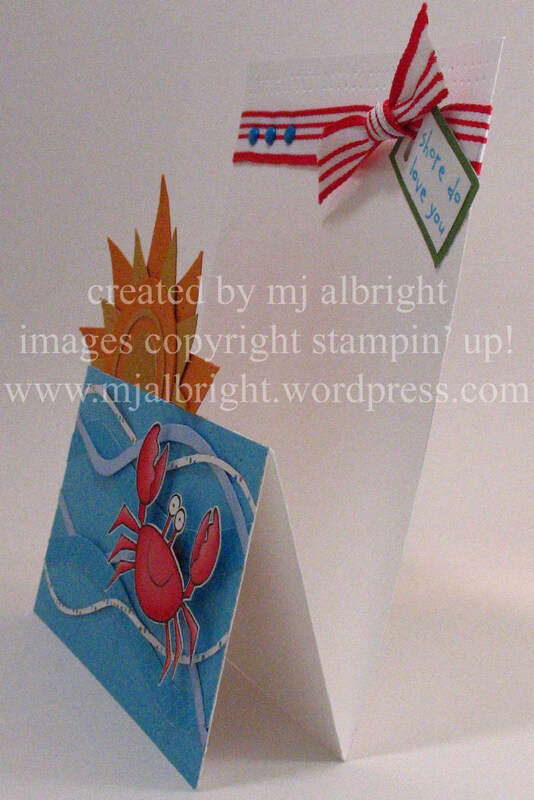 Awesome card – I love the unique fold and the dimension – you obviously put a great deal of work into this one and it turned out FANTASTIC!!!! Oh Mary Jo, this is ADORABLE! 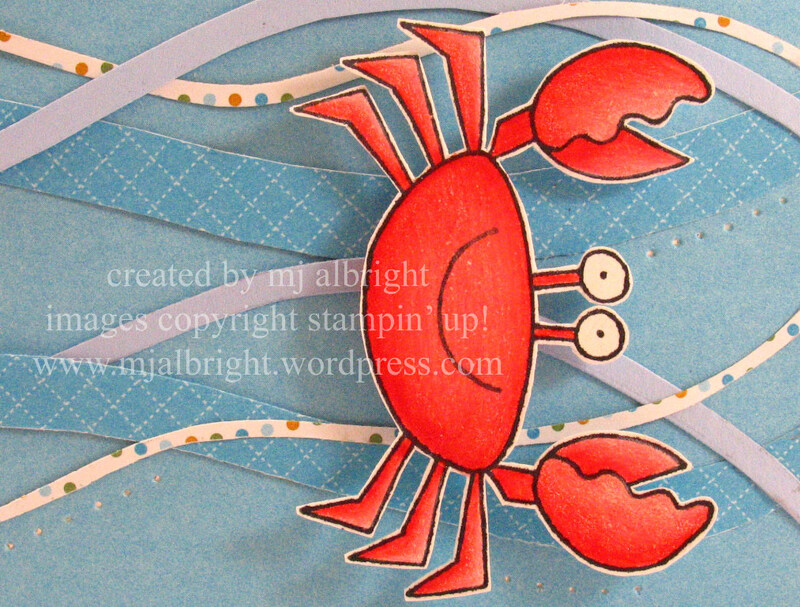 I love that tilting crab. . .too cute! 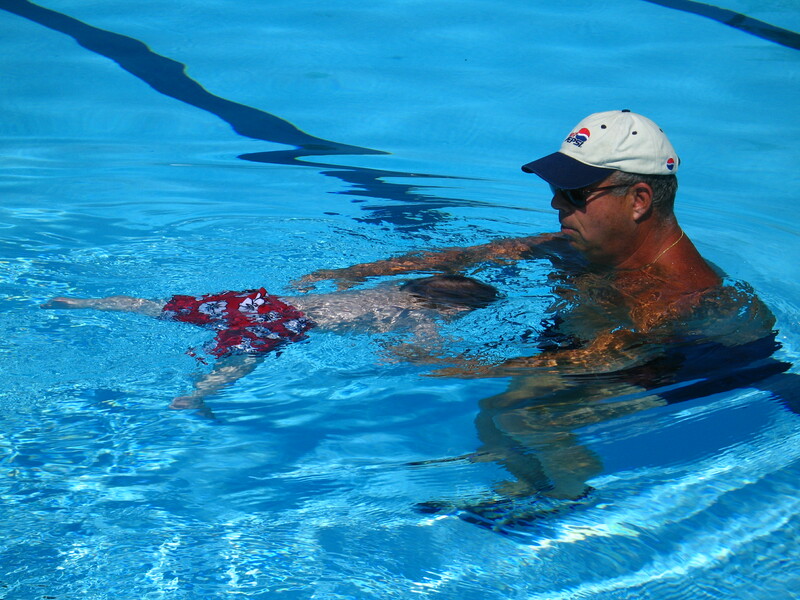 We just got a pool last year and I totally agree, swimming lessons help but parental supervision is a must. I refused to get a pool until my youngest was old enough to know better and listen to rules. Now he knows that going in the backyard is a no-no without adults and we have double locks and chimes/alarms on our doors. And I love having a pool. It’s such great family time. And your card is so fabulous!!! I am drooling as usual!! I love the opening for this card! Great idea and I cant wait to try something like this myself. TFS! Oh HOW adorable! I LOVE your waves!! Those are a super cool addition to the card. And of course your sun is HOT!! OMG! Mary Jo you amaze me with the creations you come up with!LOL! This is just too cute! The crab is just soo cute! Love your dp waves! Omg! This is SO stinkin’ CUTE and CLEVER! la la la la looooooooooove it! OH MY GOODNESS! You never cease to amaze me. This is so wonderful! I just love the way you made your waves! Awesome, as always! Darling card Mary jo, LOVE the fun colors and detail. Thanks for sharing the pictures Mary jo, I can’t get over your little boy, what a little fish. SUPAH card! I love the details of the waves! Beautiful work, and thank you for sharing this technique. I will be sure to try it the next time I need a card for a special person! Thanks for sharing this amazing card and technique with us!